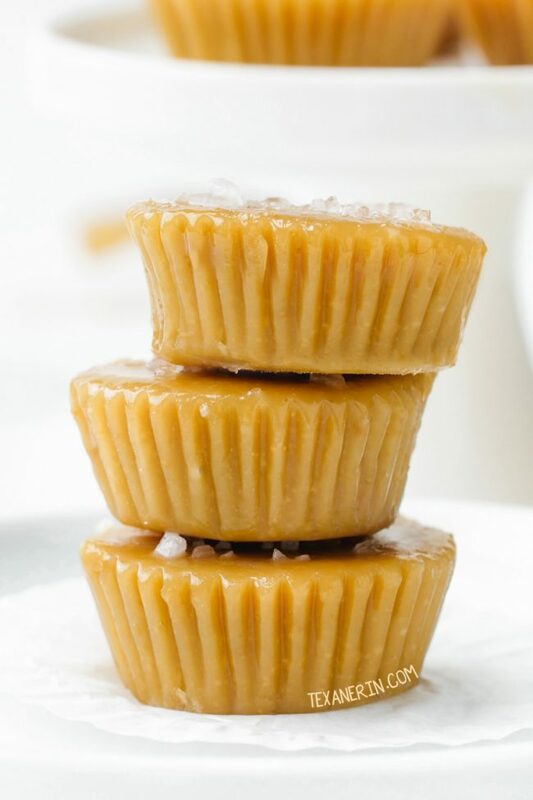 Easy and delicious caramel fudge candy that’s basically just cashew butter, coconut oil and maple syrup. 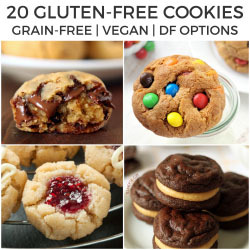 Paleo, vegan, gluten-free and dairy-free. It’s been way too hot to bake lately. When the kitchen’s 86 °F and we don’t have air conditioning, there’s no chance I’m baking. We’ve even been cooking on a small portable induction cooktop on our patio to avoid heating up the kitchen even more. So when a sweets craving came upon me, I went with one of the quickest and easiest recipes I could think of. 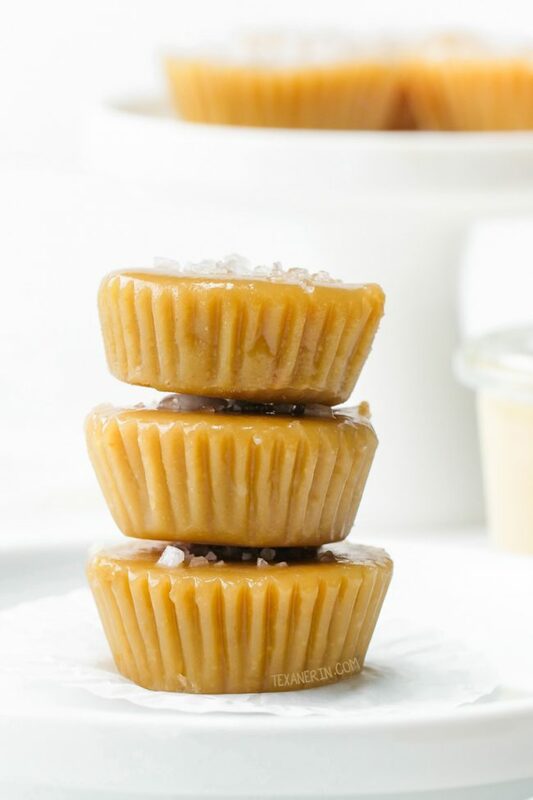 All you do to make these little caramel fudge candies is boil everything for 2 minutes, pour into molds and then pop into the freezer! This vegan key lime pie or these paleo lemon bars would be excellent no-bake choices for when you’ve got a bit more time on your hands! These little fudge candies are best refrigerated or frozen and then defrosted a bit. They’re not too hard out of the freezer but they don’t really melt in your mouth when they’re that cold. I wasn’t really sure what to call them. They’re not fudge and they’re not exactly caramel, but something in-between. So… caramel fudge candy! Whatever they are, they’re SO good. Store-bought cashew butter is so ridiculously expensive so I always make my own. Check out this post on how to make peanut butter and use roasted and salted cashews instead of peanuts. 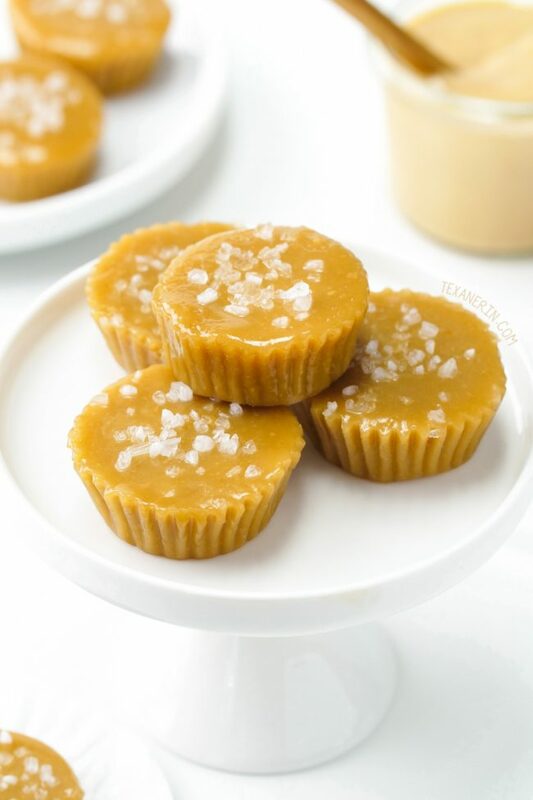 And once you have your cashew butter, then you can also make this paleo lemon fudge, which is one of my very favorite recipes! It’s one of those recipes that hardly anyone looks at because it’s such a strange thing to be looking for. That makes me sad because it’s seriously so delicious and easy to make. If you don’t use salted cashew butter, make sure to add salt after mixing everything together! It’s absolutely necessary to the deliciousness of this recipe. :) It gives the candy this salted caramel kind of thing. 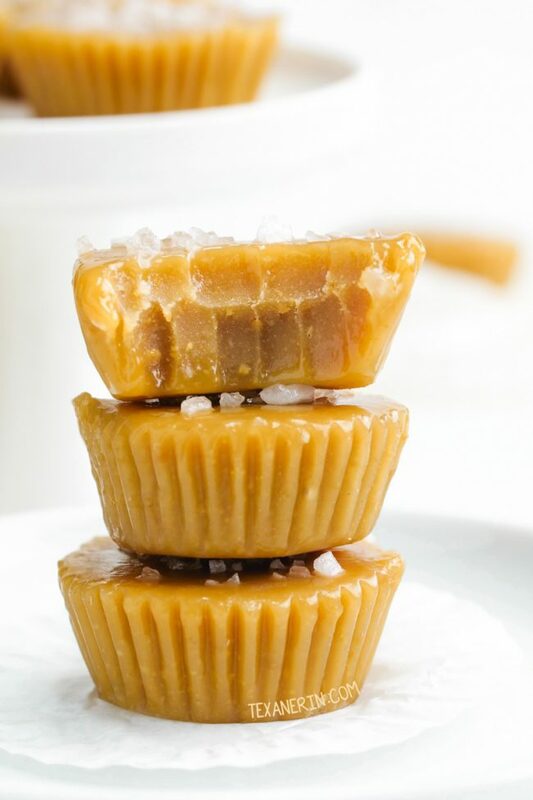 And if you can have dairy and are looking for something a little more traditional, these homemade soft caramels look amazing! Questions about this caramel fudge candy? What can I use instead of maple syrup? I’ve tried honey but it doesn’t really work. You don’t get the right caramel-like texture and the end results tastes strongly of honey. Another thinner liquid sweetener might work but I haven’t tried it so I really can’t say for sure if it’d work. What can I use instead of cashew butter? I’ve made this with peanut butter (for a non-paleo version), almond butter and sunflower seed butter for a nut-free version. If you use almond butter, it won’t taste caramel-like at all. But it’ll still be yummy (although I think some added cinnamon would be a good idea!). What can I use instead of coconut oil? Butter works for a non-paleo and non-vegan version. I’m not sure about ghee or any other fat. Line a mini muffin pan with 12 waxed or silicone muffin liners. Pour into the liners and place the pan in the freezer. If you don't have room in your freezer, refrigerate for a few hours until firm and then transfer the fudge pieces to a small container that does fit in your freezer. Freeze / chill until the tops are no longer runny, top with flaky sea salt and return to the freezer. Freeze for about 2-3 hours. The liners will be easy to remove once the fudge has thoroughly frozen. They'll stick if you try to remove them too early. Store in the freezer for up to 3 months or the refrigerator for 1 month. If storing in the freezer, defrost for about 10-20 minutes at room temperature. 33 comments on “Caramel Fudge Candy (paleo, vegan)” — Add one! I love how simple the ingredients are! These look amazing can’t wait to try them! I have made a similar fudge with almond butter. I bet the cashew butter makes it super creamy! Can’t wait to give it a try. My mom used to make fudge for us when I was little! I think I have to give this recipe a try – YUM! Oh my goodness, this looks melt-in-your-mouth tasty! I can’t wait to give it a go! Easy, delicious, and paleo?? I’m so in! Hi. Would this recipe work with coconut butter instead of cashew butter? Hi! Sorry for just now answering. Was traveling all day yesterday! I don’t think coconut butter would work. It has a totally different consistency. Sorry about that! I made these the other day and they were delicious. I added chopped up walnuts to the mixture as well as on top which added a nice crunchy taste! Chopped walnuts sounds like a tasty addition! And yeah… I have an issue with this recipe, too. That being that I can’t prevent myself from eating the entire batch on the first day. :| They’re just too good! I keep running back to the freezer. Thanks so much for your feedback (and sorry for just now seeing it!). I’m so happy you liked it. :) Peppermint flavoring sounds delicious. Thanks for your comment and sorry for my slow reply! Thanks for your reply! The peppermint made them grainy, so I think sticking with the vanilla is better. Interesting! I never would have thought that’d happen. Thanks for the tip! Can’t wait to make these to have a stash on hand in the freezer!! These look incredible! These are on my must-make list! Caramel Fudge sounds amazing! Oh my word! I may have to try the peanut butter version! My kids will love these fudges! They look so inviting! This caramel fudge candy looks so delicious! I love that it’s gluten-free. I’m going to make this when my mom comes to visit next week! Love how easy these are to make! They look dangerously addictive! Yum! These look like the perfect dessert! 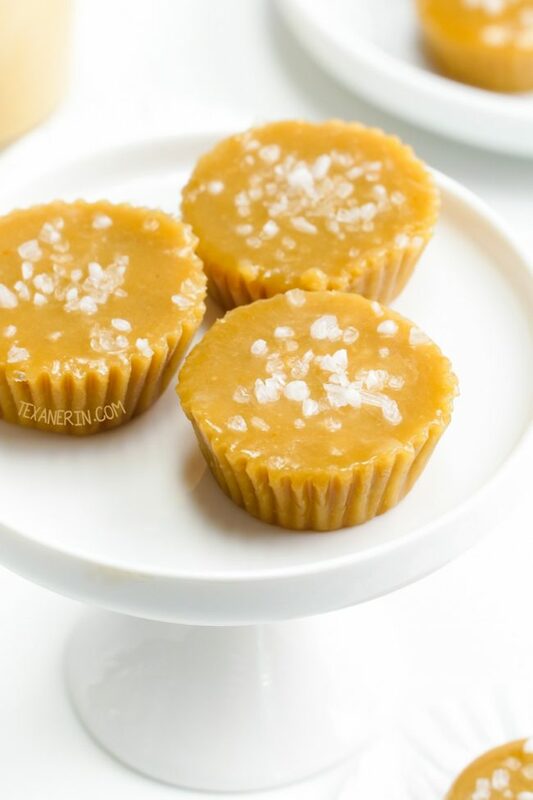 I am loving the idea of caramel fudge made with cashew butter! So tasty! Shouldn’t ask, but how many calories per piece? Do these need to stay in the freezer? I am going to have to try these. I LOVE caramel. But I need some refined coconut oil since all I have here is unrefined and I do not like coconut flavored caramel! This looks like a great recipe! Thank you! You’re welcome! I’d love to hear how it comes out. :) I used unrefined and they didn’t taste of coconut but I’m sure if you use refined, they’d taste even more caramel-like. Hi! I’ve never used that so I really have no idea. I googled it and am not sure if it’ll work in this recipe. Sorry about that!